I have been injured for sometimes after accident earlier last month, and I basically stop most of routine exercise, including cycling due to broken arm. But this morning, I felt very alright and fit in shape to do cycling again from as early as 4:30am. I grabbed one of my most favourite bicycle suitable for Bangkok road conditions (bumpy, and ridiculous road construction of which can cause you major accident if you don't avoid it well), i.e. Rotwild C1 hardtail. 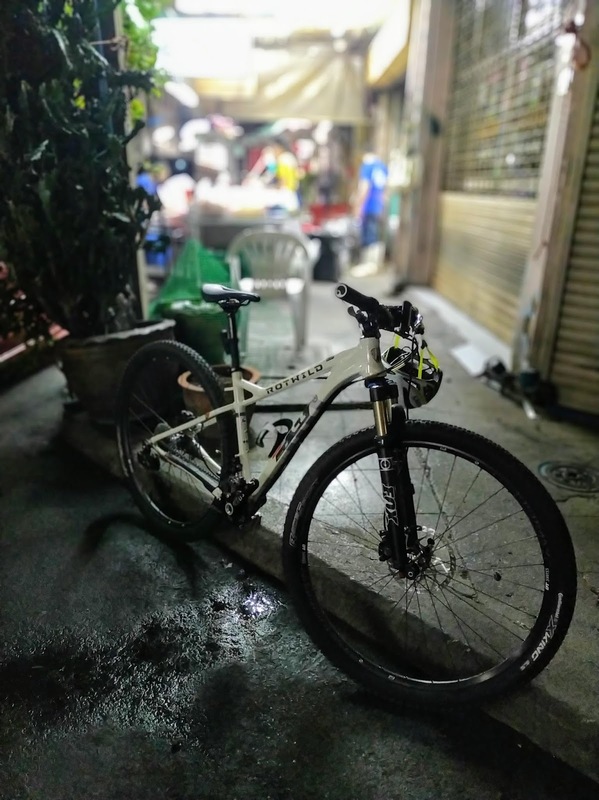 It is a mountain bike with hardtail (no rear suspension), and as soon as I took off, the same nice old feeling came back to my mind. My residence is considered to be in the middle of Bangkok business district on Sathorn Road, so I strated off from there, then heading towards Sam Yan, which is within Chulalongkorn University area for breakfast, which is Pork Congee with softboiled eggs. After breakfast, I rode through Chinatown, the Grand Palace where Emerald Buddha situated. Then heading back through Silom, Sathorn, then stop by at Dean & Deluca at King Power Mahanakorn tower for a nice cup of coffee, which I had to wait until 7:00am for opening time. One comment about King Power Mahanakorn tower, it looks so much different than last time I went there (for at least 6 months). I felt the taste of new owner doesn't suit my style. Anyway, after coffee I went to Sathorn district office to gather some papers then to Yannawa district office for another official papers, and then concluded my ride back to my residence.